Whether campers have lots of experience hitting the links or are just beginners, we have a place for them in our golf program. 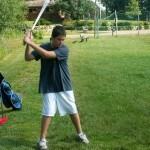 Campers advance through our three levels of golf as they develop their skills. Beginners will work through various exercises with our instructors as they learn the basics of golf. Our beginning golfers will use our golf nets, play tennis-ball and whiffle ball golf, as well as reduced flight golf balls to simulate real golf course conditions. 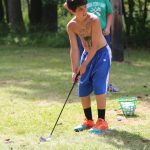 Once campers advance past beginning, or for those campers who come to camp with a base of golf knowledge, we leave camp grounds to utilize local resources. 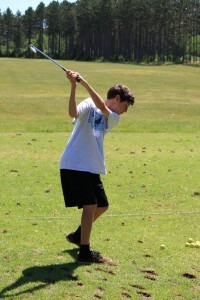 The first step is at the golf range where campers work with our instructors to improve their swing and stance. When campers are ready they sign up to play on the course. 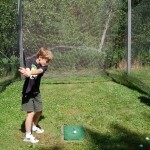 There are many excellent golf courses that are located near North Star such as Spider Lake Golf Resort and Big Fish.